B. Thomas (Arlington, Texas, United States) on 29 November 2009 in Landscape & Rural and Portfolio. I am amazed at how smooth this lake is! Usually it is difficult to get a large body of water to be completely smooth - but you did it! Great reflections and an incredible location! A placid lake of this sort is just so heart-soothing. A wonderfully realized image !!! @Dulcie: Thanks so much, Dulcie. A wonderful shot..the reflection is stunning. I could look at this all day! @MrsAmber: Thanks. I thought this is the sort of shot you like (as do I). @Pepe Cabrera: Thank you, Pepe! The weird thing about this fantastic reflection Barbara, is that is has more colour than the hill behind it! @Curly: That is weird, isn't it? beautiful scenery! lovely soft light and calm mood! the surface is perfect - almost still with just a gentle ripple - it fits the overall ambience perfectly! @DarkElf: Thanks. The wind was just about to pick up, and a few minutes later there was a lot more ripple. @Anina Botes: Thanks, Anina. It was very clam and quiet. What a beautiful still lake with nice rock bottom. Nice capture. @Lambspun: Thanks. 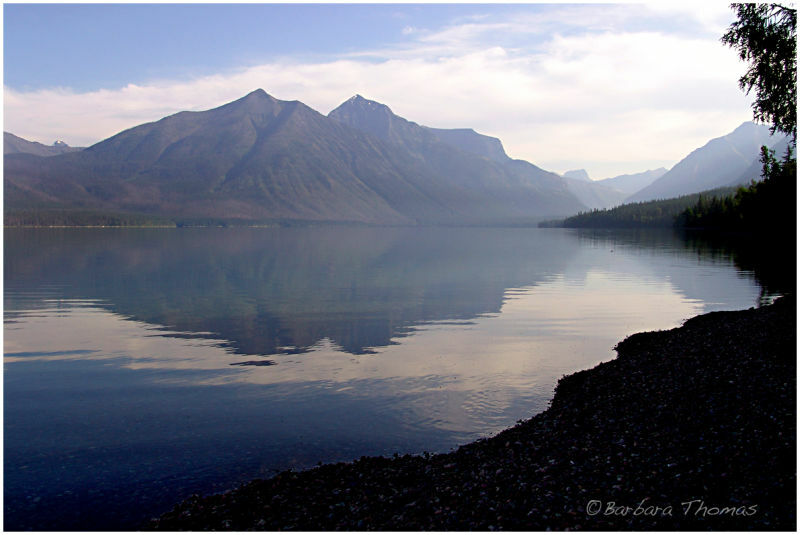 It's a gorgeous lake - Lake McDonald in Glacier.